No more worries about losing connectivity on your journey. 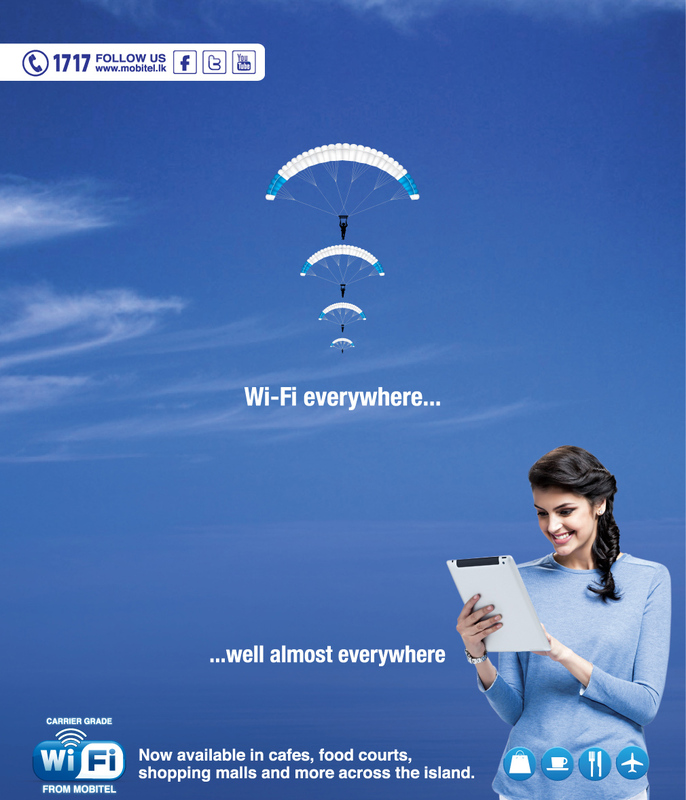 Mobitel is now proud to present Wi-Fi hotspots to our valued customers. You can now access Uninterrupted High Speed Internet on your device from Mobitel Wi-Fi hotspots located all over the country. All Mobitel existing customers and new users are eligible to use this facility. Switch on Wi-Fi of your device. Select ‘Mobitel_Open’ on the drop down that lists available Wi-Fi networks and connect. Select web browser, now you will be re-directed to the Mobitel Wi-Fi login page. Select the Service Type as “Walkin” and enter Created Username & Password. How to create a Username & Password? Select the Service Type as “Mobitel Subscribers”. Enter the mobile number and click “Get Access Code”. Enter the 4 Digit Number Access Code and sign in. Customers now have the opportunity to get a 4G Wi-Fi router free of chargeor at a special rate from Mobitel when they subscribe for a selected Postpaid Internet package. Customer can choose a device model and go for any given Postpaid connection under the mentioned scheme. From where can these 4G Wi-Fi routers be purchased? These 4G Wi-Fi routers are currently available at all Mobitel outlets Island wide. 4G Wi-Fi routers also can be delivered to any location on request. What are the data packages customers can select along with the dongle? Do the customers have to sign an agreement when purchasing the offer? Yes. Every customer should sign an agreement valid for a period of 12 months with Mobitel. What will happen if any customer disconnects the connection within the contract period? Customer will get charged a penalty as per the selected package for the remaining months. What can the customer do after completing the contract period? The Customer can either continue with the same package or have the option to change to any Postpaid Internet package available. How can a customer get information on the 4G coverage? Customers should contact Mobitel hotline via 1717 or visit the nearest Mobitel branch for more information. · Customers should purchase the 4G Wi-Fi router and package at the same time. If a customer requires only the 4G Wi-Fi router he/she should pay the standard price for a 4G Wi-Fi router which has mentioned in question No. 04. What is Carrier Graded Wi-Fi? Wi-Fi Network which is capable of highly advanced technical Features and availability. It is a new technology that allows customers to access the internet via Wi-Fi without having to fill in the username & password (seamless). Customers just need to insert their SIM Card into their devices that support EAP-SIM technology. 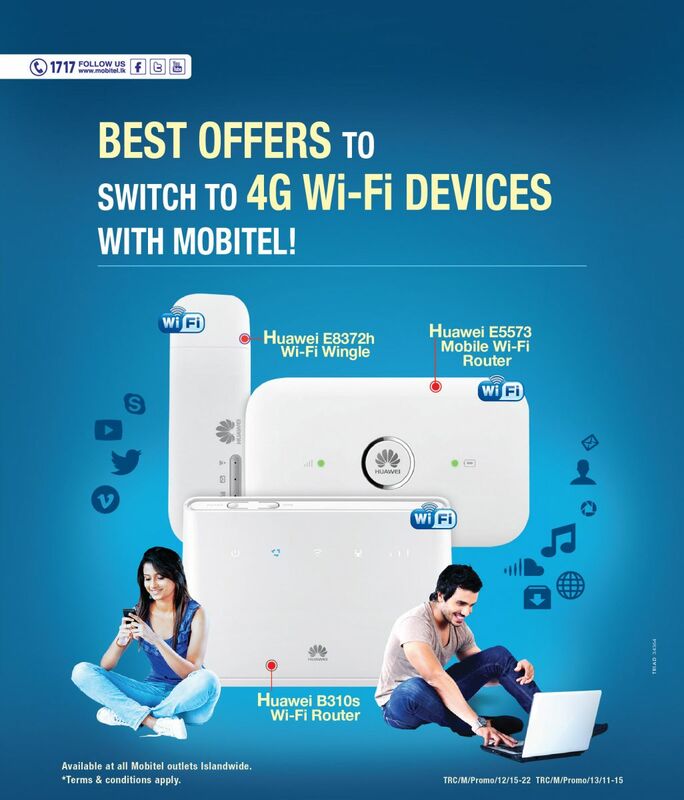 What are the advantages of Mobitel Carrier Graded Wi-Fi? Seamless connection that allows customers to connect Mobitel Wi-Fi network without having to fill in the username & password. This technology is applicable for handset that has supported EAP-SIM technology. Is there a limit of quota/speed if customers are using Wi-Fi as a Mobitel Customer? No, there isn’t. The quota and speed are unlimited, but it depends on credit status of the connection. Power of the Wi-Fi signal. The number of users who access at the same time. Servers that are accessed by customers. How to enjoy the Mobitel Wi-Fi service with seamless connection feature? Customers need to insert their Mobitel SIM Card and follow each step of settings as described in each handset settings guide. Is it possible to use Mobitel Wi-Fi as a Mobitel Customer to connect internet without inserting SIM Card into the device? No, it is not possible if the connection to Mobitel Wi-Fi network is through seamless connection because the authentication process is based only by using SIM Card. If the connection to Mobitel Wi-Fi network is through the landing page of “Mobitel-Open” hotspot by logging in first, then to receive the OTP the SIM should be inserted at least on another device. Is it possible to use Mobitel Wi-Fi with a connection from another operator? Yes, as a non-Mobitel User it’s possible. Is it possible to use Mobitel Wi-Fi as a Mobitel customer, if the connection has run out of credit balance or the line has been disconnected? What are the types of handsets eligible for EAP-SIM feature? Handsets with Blackberry operation system, Apple iOS, Android, Windows Phone, and many others in line with technological developments. What are the basic parameters to use Mobitel Wi-Fi with EAP-SIM technology? Security Type Selection: EAP-SIM and SSID: EAP_SIM. Why customers who use iPhone or iPad are always required for the username & password whenever they try to connect to “EAP-SIM” hotspot/SSID? Due to the uninstall driver on Apple’s devices needed for EAP-SIM. Check the installation steps on this page and click on Settings tab. I forget my username & password of Mobitel Wi-Fi account, how to regain those back? Go to “My Account “select Forget Password and enter the username and answer for the secret question entered on the account information, then the password will be shown. How the customer can change Wi-Fi Username or the Password? Customer can login to “My Account” and do the changes. If a customer registered a Wi-Fi Account through a Mobitel Physical Prepaid Card or Credit Card Payment can the customer use the balance quota of that package on another Wi-Fi location? If the customer’s Wi-Fi Quota is finished or about to finish, can he recharge his account? Yes, the customer can recharge the account from the account created location or another Mobitel Wi-Fi available location. Can the customer recharge his account through credit card payment? Yes, if the customer has created an account with a Mobitel Physical Prepaid Voucher, recharging is possible with Mobitel physical voucher cards and credit card payments, Vice versa if the customer created an account through a credit card payment it’s possible to recharge he account with a Credit card payment or Mobitel Physical prepaid voucher. On a Wi-Fi Reselling location if a user created an account, can the customer use it on another Mobitel Wi-Fi hotspot under Mobitel_Open SSID? No, the user can access Wi-Fi with the created account only from that particular Reseller’s SSID. Can the customer recharge the account with a Mobitel Physical Prepaid voucher or a credit card payment? No, only possible with a voucher provided by that particular reseller. Can the customer view the usage of the account created for Wi-Fi? Yes, under “My Account” portal customer can check the usage.